This is a great recipe that I stumbled upon on Genius Kitchen over a decade ago. I've modified it for special diets, and added some personal notes. 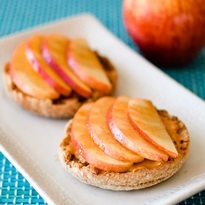 Spread 1 tablespoon of the nut or seed butter onto the split side of each English muffin half. Top each half with a few apple slices. In the microwave or in a small saucepan over medium-low heat, melt the brown sugar, buttery spread, and cinnamon together. If using the microwave, just heat in 15 to 30 second intervals and stir frequently. Cook just until smooth. Drizzle as much of the cinnamon mixture over the apple slices as you would like. Leftover cinnamon mixtures can be stored in an airtight container in the refrigerator and warmed to use on future mornings! English Muffin Note: I made these with Trader Joe's Whole Wheat British Muffins. Some brands do contain dairy, so be sure to check the label. You can use a dairy-free, gluten-free English muffins, like Katz. Please note that Udi's English muffins do contain milk. Sweetener Note: I attempted these with coconut sugar, and it stubbornly wouldn't melt. For an unrefined option, I recommend trying maple syrup in place of the brown sugar.